We did things a little bit different this year for our Christmas. It was so hard to plan for everyone to come together for Christmas dinner so we had it on the 23rd, as that worked for everyone. We had our usual prime rib roast instead of turkey. We exchanged our Secret Santa gifts and fun was had by all. We got to spend most of the day with a new grandbaby as dinner was at our son's place. He and his wife graciously hosted this years dinner. My Man and I provided the meal and all was well. My menu plan for Christmas Eve strayed from the usual meat platter and vegetable tray with buns, and snack type food to homemade Seafood Chowder and buns. That went out the window as My Man requested hot roast beef sandwiches made from the leftover prime rib, which had been my plan for our Christmas day dinner. It was easy to switch the menus around. Christmas Day, our youngest son, Dustin and his lady, Crystal, came by for a visit and brunch before heading off to her grandparents for Christmas dinner. Dirk and Sam brought Freya over to open her gifts from us, and Noah came home from his visit with his mom and another visit with his other grandmas. Scramble eggs. 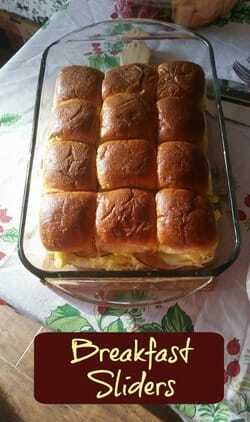 While eggs cook, cut the entire pkg of buns so that you have a sheet of bottoms and a sheet of tops. Place bottom sheet in a square baking pan and top with a thin layer of provolone cheese. Cover with cooked eggs. Lay ham slices over the eggs. If your provolone is really thin, add 2 more slices over the eggs and then again over the ham. Place top sheet of rolls over the ham. (At this time, you can cover and store in the fridge). In a small bowl, combine the melted butter, mustard and brown sugar. Stir until well combined and the brown sugar is mostly dissolved. Then coat tops of rolls with the mixture. Bake at 350 degrees for about 10 to 15 minutes until cheese is nice and melted. Remove from oven and let stand for a few minutes. Cut and serve. This would make a great addition to a New Years brunch this weekend!! !